Gallery of small narrow gauge raiwlays in Japan. Though most of Japanese railways including JR lines using narrow gauge of 3ft 6inch, below mentioned railways use gauges less than 3'6"
This railway was renamed to Bandai Express Electric Railway. However, electrification could not be achieved and the railway was abolished in 1969. (upper right) Railway bridge was replaced and does not exist any more. Photo in Jul, 1993. (lower left) DC121 and two coaches are preserved at Inawashiro Midori-no-mura. This livery is different from the original. Photo in Jul, 1993. 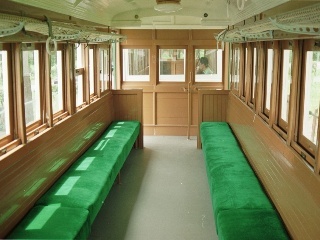 (lower right) The interior of the coach Bosaha12. This railway was routed in the highland resort area, but it was abolished in 1962. (right) The station building of Kita-Karuizawa exists. Photo in May, 1995. NAKAYOSHI railways is a play facility for children in Komatsu, Japan, and preserves single diesel car Kiha1 from abolished Ogoya Railway in this city. This is a quite precious Japanese 2ft6inch narrow gauge railway in operative condition. Operation is only Wed, Sat & Sun. Diesel Loco DC121 can be seen in the garage. Filmed in Nov, 2010 and Photo in Sep, 1993. (left)Terminus of abolished Ogoya Railway was existed here. 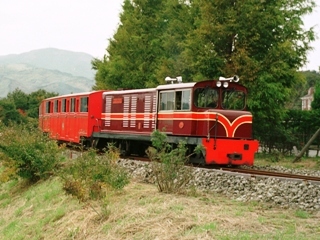 (right)Preserved single diesel car Kiha3. Filmed in May, 1993. Locomotives and cars are preserved at formar Hakkenmachi depot of Kubiki Railway. Filmed on 9 Nov, 2008. (lower right) Snowplow car "Raki" is preserved at "Yume Farm" in Narita city. 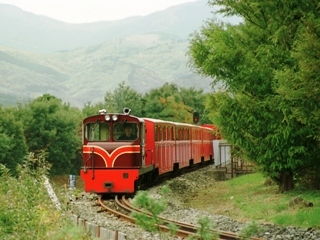 Shimotsui Electric Railway was abolished at the end of 1990. All cars are preserved at ex-Shimotsui Station. (upper left) "Graffiti car", EMU Moha-1001. (upper right) EMU Moha-103 & Kuha-24 with Fujifilm ad paint. Photo at Shimotsui in Nov, 1990. 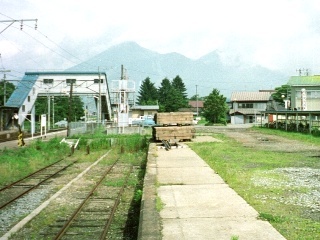 (lower left) The station building of Shimotsui, the origin of the railway. Photo in Nov, 1990. 1971年に廃止された井笠鉄道。Ikasa Tetsudo Railway was abolished in 1971. 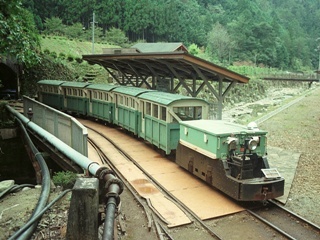 (upper right) Single diesel car Hoji3 was preserved at Shimotsui Railway. Photo in Nov, 1990. 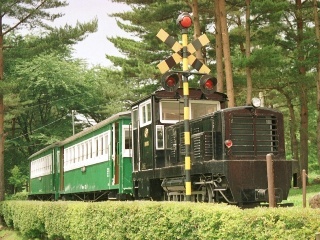 (lower left) Single diesel car Hoji101 and a coach Hoha8 are preserved at Kyogamaru Green Park in Ibara city. Photo in Feb, 1997. (lower right) Formar Yoshida-mura station. The Shuzenji Romney Railway is a 381mm gauge pleasure line in Japan. Some locomotives are imported from Romney, Hythe and Dymchurch Railway in UK. Battery locomotives from formar Kishu Mine are used for transporation of Hot Spring Photo on Oct, 1993.